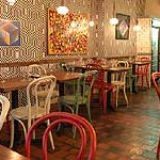 La Porchetta in Bloomsbury is a popular eatery with locals and visitors alike. A family run restaurant they offer a variety of authentic Italian fare. Do you work at La Porchetta? What did you think of La Porchetta? I was recommended this place by a friend and we were told about the great pizzas that they do here. We held a hen dinner for my best friend at the Holborn branch. The manager and his staff were great and helped me decorate our area before my friend arrived. The pizzas were huge and delicious. We also enjoyed their homemade tiramisu which was gorgeous! Thanks again to the team for making our evening so special. Adore this place. Fantastic food - the Bruschetta di Montagna a definite favourite. Deciding on whether to go for a pizza or pasta is always hard as you're spoilt for choice and the home made tiramisu is to die for. With the food so reasonably priced and such a friendly service you really can't fault it at all. Best Italian food in town. Really happy we chose this restaurant to have a lovely meal. The service was great, friendly staff and quick service. The food was delicious, especially the Insalata Tiziana and the pizza vegetarinana. The ambiance of the restaurant was perfect, warm and cosy. we highly recommend La Porchetta. Can't wait to dine there again! Im a La Porchetta fan, ive been to most of them! This place is cosy, romantic and feels like a real italian trattoria! Being Italian i can vouch for the food, especially pizzas! Top Notch! The staff always are friendly and very helpful and always keep my children entertained, dont expect silver service because it not the type of place. La Porchetta has excellent food (the rissotto nero is fantastic), big portions, good value for money and very friendly staff. Even on a week night, business is brisk at this Bloomsbury trattoria. It's not exactly obvious why, especially as its location offers little passing trade. Something, though, brings the locals back time and again. 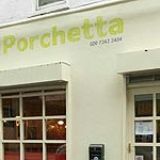 One of a London-wide chain of five, the 80-cover Bloomsbury branch of La Porchetta is tucked away in a pleasant side street, a scalpel’s throw from Great Ormond Street Hospital and Russell Square. Most of its neighbours are genteel mansion flat blocks. 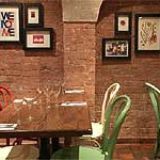 The décor comprises uncovered dark wood tables and paper napkins, simple, bentwood chairs painted in red or green and a typical pizzeria’s terracotta tiled floor. A wall of groovy wallpaper pulsates like a Bridget Riley painting, funky pendant lights hang from black, looping cables, and both modern abstracts and kitsch '70s portraits adorn the walls. The ground floor with its big front window and open kitchen to the rear is a better bet than the bigger, windowless basement. Up to eight diners can be squeezed onto the street on summer nights. The waiters love a joke or three, and there is much joshing with regulars. That's not to say that they aren’t also professional, offering menu suggestions and well-paced, accurate service; a loud, hen night-type party is smoothly and skilfully consigned to the empty basement, for example. Pizza and pasta is what this place is all about with thirty four of the former (including three, folded, calzone options) and twenty seven of the latter. There are five fish and meat alternatives plus some salads and sides. Mixed olives with a good chilli kick are a happy accompaniment to menu perusal but cost £3.25 rather than being complimentary. Similarly, if three slices of admittedly good, warm, crunchy, char-grilled bread cost £1.50, can’t they at least come with a little pot of softened butter rather than hard, individual, foil-covered tablets? Maybe it's because the Italians don't usually ask for any, so at least it shows some authenticity. What could be more retro than avocado with prawns in Marie Rose sauce? Only the price (£6.50) and the presentation have changed. The chef has finely sliced the pear and teased it into a ring to contain the prawns, and there's a five-pointed star of sauce. It still tastes just like it did in the '70s, though. Funghi ripieni (£5.25) is six medium-sized mushrooms stuffed with cheese and finely chopped veg bubbling volcanically in an earthware bowl of clearly homemade tomato sauce. It’s as rich as it sounds and needs that char-grilled bread. As for mains, linguine mare e monto (£10.95) is a simple concoction of well-judged pasta, gutsy chorizo and large, flavoursome prawns in more of that authentic tomato sauce. The portion is positively huge - even a starving navvy couldn’t finish it. Parmesan is proffered, even though seafood is involved (something that would scandalise many an Italian, but probably keeps the Brits happy), but at least it’s grated freshly at the table from a chunk. An equally massive deliziosa pizza (£8.95) is okay; there’s rich goat’s cheese, stoned black olives and cruncy, nicely charred sweet pepper strips. It’s crisp round the edges but a bit soggy in the middle. The dessert list is short and uninspiring, dominated by bought-in ice creams, and even then only in chocolate, strawberry, vanilla and pistachio flavours, although more interesting options are promised in future. Strawberry is the intensely fruity stand-out. Affogato (£3.95) is two scoops with a cup of really great hot coffee poured over. The modest, mainly Italian wine list includes half a dozen whites, seven reds, a couple of rosés, a Champagne and a prosecco, none of which break the £30 barrier - not even the champagne (Lanson Black Label at a very fair £29.95). House wine is simply described as ‘vino della casa’ but the white turns out to be an extremely pleasant, unoaked chardonnay, the red a fruity, slightly spicy Sicilian merlot (neither are available by the bottle but £3.25 for a small 125 ml glass, £3.95 for 175ml, £5 for a half litre carafe and £14.50 per litre). No dessert wines are listed but a chilled limoncello (£2.95) is a good alternative. 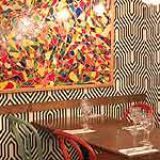 Regulars, locals and tourists all leave La Porchetta with a smile on their faces but is this due more to the fun atmosphere engendered by the jokey staff than the food? 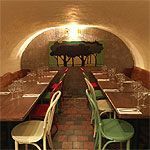 It can’t particularly be the prices – three courses with half a bottle of modest wine will set you back £35, which is about right for what it is. It's probably best to dispense with starters, sides and probably the forgettable puddings, too - you’ll save a bit of money and might even finish your giant pizza or pasta.